Nancy Kilpatrick indicates that David Bowie's look in the 1970s is the initial inspiration for the style, and that Fritz Lang's Metropolis provided the prototype for cyber aesthetics. Cybergoth neon fashion under a nightclub black light. 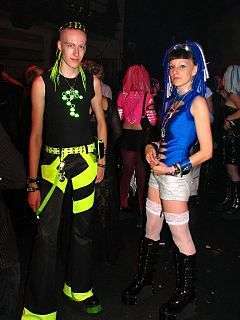 Cybergoth fashion combines rave, rivethead, and goth fashion, as well as drawing inspiration from other forms of science fiction. Androgyny is common. The style sometimes features one starkly contrasting bright or neon-reactive theme color, such as red, blue, neon green, chrome, or pink, set against a basic, black gothic outfit. Matte or glossy black materials such as rubber and shiny black PVC can be mixed and matched in an effort to create a more artificial look. The black-and-monochromatic juxtaposition can take a variety of forms, including brightly colored hair and make-up, cybernetic patterns such as live LED circuit boards, body modification, gas masks and goggles (especially aviator-style), typically worn on the forehead or around the neck rather than on the eyes. The most common use of a theme color is in the hair or eye make-up. Artificial, extended hair or "falls" are sometimes used to create this added effect. Falls can be made of various materials, ranging from yarn to fluorescent tubing to electrical wiring. Popular club gear for cybergoths includes tight black pants, tight black vests or shirts cut from ripped, solid or fishnet fabrics, fluffies, resembling costumes from 19th Century Gothic novels or early black and white horror films from the mid-20th century. Companies that specialize in the style include Cyberdog, DANE in London, Pen & Lolly Clubwear based in Sheffield (UK), Lip Service, based in Southern California (US), and Diabolik, a shop in Montreal. Cybergoth style incorporates extravagant hair pieces and styles, including synthetic dreadlocks (known as cyberlox), hair extensions and so on. These hair pieces can be made of a variety of materials, from real hair to synthetic kanekelon hair, plastic tubing, tubular crin, rubber and foam strips, belts, and are often accented with goggles. In the first decade of the 21st century, the instrumental, computer driven, synthesized hypnotic tempos and textures of the trance music of the late 1990s were transformed into futurepop, a term coined by Ronan Harris of the UK band VNV Nation and Stephan Groth, vocalist of Apoptygma Berzerk. Other associated music includes aggrotech, power noise and club-oriented dance music styles such as techno, drum and bass, acid trance, darkstep, synthpop, electropop, gabber, hard trance, hardstyle, dubstep, dark psytrance, ebm, dark gothic, industrial, cyber, and gothic industrial. 1 2 3 Nancy Kilpatrick. The Goth Bible: A Compendium for the Darkly Inclined. New York: St. Martin's Griffin, 2004, ISBN 0-312-30696-2, p. 35-36. 1 2 Kilpatrick, Nancy (2005). The Goth Bible: A Compendium for the Darkly Inclined. UK: Plexus. p. 55. ISBN 0-85965-365-X. ↑ "Being a little bit productive". Sorted magazine. 2002.